We are so pleased to announce the winners of our September Challenge: Take A Stamp! We loved this gorgeous card! Such an elegant and sophisticated colour scheme, and the stamping is amazing! 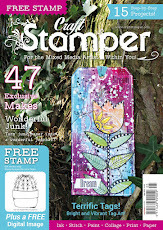 Mac Mable will win a Guest Designer slot here on the blog, her very own Winners Profile, and of course her amazing art will be featured in it's own 2 page spread in Craft Stamper magazine! Congrats Mac Mable! Our October challenge will be launched next Friday, October 7th. Welcome to our Throwback Thursday tutorial.... settling in to our regular, once a week look back at an amazing project first featured in Craft Stamper Magazine! "For this project I really wanted to make the diffusing technique the star of the show and to this end I’ve created an airbrushed-style scenic card using the Distress Marker Spritzer and Distress Markers. Working with the Spritzer is easy but there are a couple of things to bear in mind. Aligning the Distress Marker brush nib correctly is very important or the ink won’t spray; with a bit of fiddling you will soon find the optimum placement. The condition of the Marker makes a difference too; some of mine were a bit on the dry side and didn’t work as well as my newer, wetter markers. I practised a bit on scrap paper before trying it out on projects so that I was comfortable with the tool. I found that expelling all the air from the hand pump after each spray made a difference both to the ease of use and my hand’s comfort! Playing around with the distance at which you spray also helps so do experiment first. I’ve concentrated the ink by diffusing very close to the card for intense colour on the foreground piece beneath the house and trees to give depth. The Spritzer can work beautifully for a more subtle application in paler colours, and with other types of markers too." Memory Box: Dies – Puffy Clouds, Modern Landscape Border. Step One: For the background and foreground cut two tags from the Framelits Rounded Tags set and the set of three puffy clouds. Die-cut one of the tags with the Modern Landscape Border die, working with the placement for an attractive scene. Step Two: Arrange the three clouds near the top of the complete arch die cut, attaching them with temporary adhesive. The clouds will act as masks. Step Three: Place a light blue marker into the barrel of the spritzer and screw in place, checking the placement of the brush nib is correct. It’s worthwhile testing the coverage on some scrap paper before starting on the background piece. Step Four: Squeeze the pump to expel air from the tip of the spritzer to the pen nib, which in turn diffuses ink from the pen to the card. Move across the card as you spritz, and the Spritzer can be guided if necessary by holding onto the pen with your other hand. Step Five: Continue to gradually build up the background spritzing with different shades of blue. The darker colours work well close to the bottom and the paler colours nearer the top. Step Six: Spritz a yellow sun near the top of the tag. Spritzing over one of the clouds and close to the card for a good circular shape creates depth, making it appear behind the cloud once the mask is removed. Step Seven: Carefully remove the cloud masks from the background and then take a grey marker and spritz very lightly near the bottom of each cloud for dimension. Step Eight: Take the die-cut foreground piece and colour the trees and house with Distress Markers only, taking care not to tear the stems of the trees which are delicate and prone to creasing. Step Nine: Fit the foreground piece back into its offcut for extra stability. Lay some low-tack tape over the house and trees to protect them from the sprtized ink. Step Ten: Spritz the foreground with various shades of green markers as before, again keeping the lighter colour near the top of the piece and the darkest colours at the bottom. Step Eleven: To create some depth to the foreground spritz some ink from a grey marker just below the house and trees, moving the Spritzer slightly from the base of these downwards into the green ink. Step Twelve: Carefully remove the tape and the offcut from the foreground, and now the individually spritzed pieces are ready to be built up into a card. Stamp around all the edges with a texture stamp, and stamp the sentiment onto the foreground piece. Wrap a length of twine around this piece and tie with a little bow. Add some glitter glue to the clouds and allow to dry. Adhere the foreground panel to the bottom of the whole tag using 3D foam tape, then attach the whole thing to another die-cut tag. Amazing tutorial, definitely one to try! The detail achieved by the spritzing is great.. Thanks Chris, we love it! See you back here next week for another detailed tutorial! 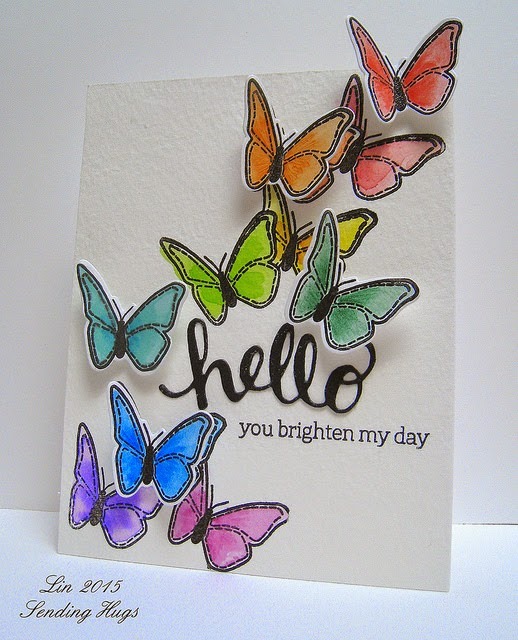 Welcome to the start of a new series here on the Craft Stamper blog! Every week, we'll be sharing a project with you all, lots of pictures and a full step by step tutorial too! A project new readers of the magazine may have missed, or for those avid readers, a reminder of a timeless and much admired creation! Enough of the talk, lets dive stright in! This is an Autumnal project, I like the sort of muted, shabby effect that is produced using the orange and blue tones. The fact that you're stamping onto tissue and layering it on also gets round the domed shape of the lid. I just pasted the tissue over the metal fixings as well so they blended in. Tissue paper is quite delicate to work with although by the time you've painted colour on the back and then blocked out in white it does get a bit more robust. However don't worry if it tears - you can always add in a little patch and no-one will notice. 1: Prep box by painting with gesso and then painting with the Bora Bora and Tango paints. Don't worry about blending them as you're going to cover it with tissue paper. 2: Paint the inside edges with the same two colours and then dilute these down to wash over the inside flat surfaces for a lighter effect. 3: Stamp lots of the houses and postage stamp background onto tissue paper with black StazOn and cut out. Start to fit pieces onto the box. 4: Flip over the tissue paper images and add a few touches of blue, orange and Spanish Mulberry pink. Then add a few highlights in white. 5: Brush Satin Glaze all over the box lid and start to stick the pieces down. Handle the tissue paper gently as it's fragile. 6: When covered, give the lid another good coating of Satin Glaze to seal and to brush out any air bubbles. Repeat process with houses on the sides and stamped backgrounds on the inside. 7: Paint some white card with the Tango paint, washed over with some of the blue to tone it down. Stencil with the VersaMark inkpad. 8: Pour over the Aged Gold powder and heat. Place stencil over again, VersaMark it, add powder and heat again. Cut out for die cuts. Repeat with Bora Bora painted card washed over with Tango. 9: Stamp the girl collage from 027 onto white card and paint quite loosely. Die cut the frame and emboss several times with the Aged Gold powder. 10: Start arranging the frame with added brads and the die cuts on the lid. When happy, stick down. We hope you've enjoyed out little stroll down memory lane! We'll be back next Thursday with another! 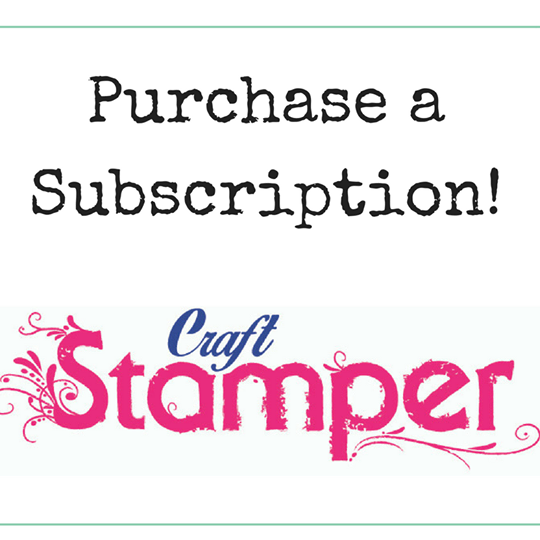 We are looking for submissions for our Ready, Set, Stamp feature on the following theme for our Febuary issue of Craft Stamper. If you've always wanted to see YOUR card in print, now is your chance!! Loll won the challenge with this amazing card! We loved the amazing texture in the stencilled fern, a stunning focal point over the background colour. A: I’ve been making cards since about 2004. A few years before that, I was invited by a friend to attend a Stampin’ Up! Party. I LOVED looking through their catalogue at all the amazing stamps, inks and variety of supplies. I was mesmerized. I bought a couple of stamps at that party and they sat for a while before I tried them out. Once I did, I was hooked on stamping. When I retired, I joined Splitcoaststampers on-line stamping community and that’s where I started posting my cards and learning all about different techniques and styles of cards. And that’s where my love of CAS (clean and simple) was born. SCS has a weekly CAS challenge and I started playing along. Within a few months, I joined the CAS design team at SCS … my very first design team. So exciting! From there, I started my blog, Stamping with Loll. I began joining in lots of different challenges at SCS and also other card challenges and my style of card making evolved into what it is today. Earlier this year, I started a card challenge along with my dear friend, Bonnie Klass. CAS Mix Up is a challenge that celebrates the CAS style, while adding in mixed media elements. It’s been a lot of fun. A: I like to work with mostly nature stamps … flowers, leaves, trees. I enjoy working with stamps from many different companies, but have to say that Penny Black is my favourite stamp manufacturer. A: I am a Clean and Simple girl. Over the past couple of years I have added more mixed media techniques and products, but maintain a clean and simple style for the majority of my designs. A: I mostly make cards, with Christmas cards being one of my favourite types to make. I usually make about 100 Christmas cards every year, mostly unique designs. I send out 60 to family and friends, and donate the remaining three dozen to charity. A: Aside from stamps and ink, I don’t think I would be able to create as many different designs without my Big Shot. It is such a versatile tool that I use every day. Congratulations on being our August Design Winner Loll , and it was lovely to learn a little more about you! Our current challenge 'Take A Stamp' is open until September 28th, so still lots of time to enter! Don't forget the fabulous prize of Visible Image stamps! Visible Image is a UK based stamp company, offering the most wonderful selection of stamps! They offer the most amazing range of images and inspirational quotes, all available in photopolymer of the highest quality. We love the range, and we're sure you will too!